What a great project to be lucky enough to be involved in. As usual, the personalities we interacted with, in designing a website for Lahood Electrical, made this build all the more enjoyable. In collaboration with local marketing guru, Arna from Fever Pitch, we created an eye-popping display of Paul’s Wanaka based electrical expertise. This was our first project with Fever Pitch, but by no means our last. Our combined efforts allowed for the best of both online marketing and website development. We wanted to assist Paul with his goals of standing out from the competition, of being able to accurately display the quality craftsmanship of his teams previous work. 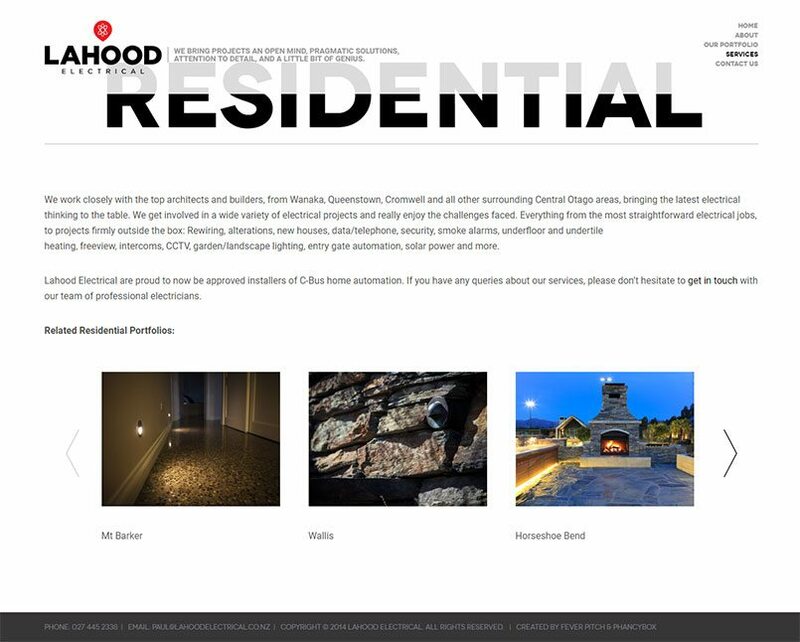 We wanted to help engage their online visitors and introduce some interactivity to Lahood Electrical’s outstanding solutions. What do you think of the Portfolio section? Crisp, clean and bold, much like the teams end results. Let us know if you’d like our help improving your online presence. Thanks Phancybox for all the work you have done on developing and setting up my Web Site You guys made the whole process so easy and streamlined everything perfectly. I would recommend Judy and Nick at Phancy Box for any project however big or small.